If you’re in the market for a new robot vacuum but you’ve been balking at the prospect of paying top dollar for a premium model, today is definitely your lucky day. 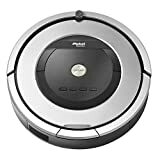 The iRobot Roomba 860 Robotic Vacuum retails for $450 and it packs features that put it on par with even more expensive options. If you pick up a refurbished 860 today on Amazon though, you’ll only pay $279.99. That’s an all-time low and it definitely won’t last long, so snag one while you still can.